So I know this post is a little late, but I really had to share with you all the catering job I did for Mother-K’s friend Mrs L. Mrs L was hosting 6 adults in the Nursery for Stakes Day, the “Family Day” of Melbourne’s Spring Racing Carnival. With free rein of the menu, I went about planning a selection of finger foods that would last well without refrigeration for the entire day. 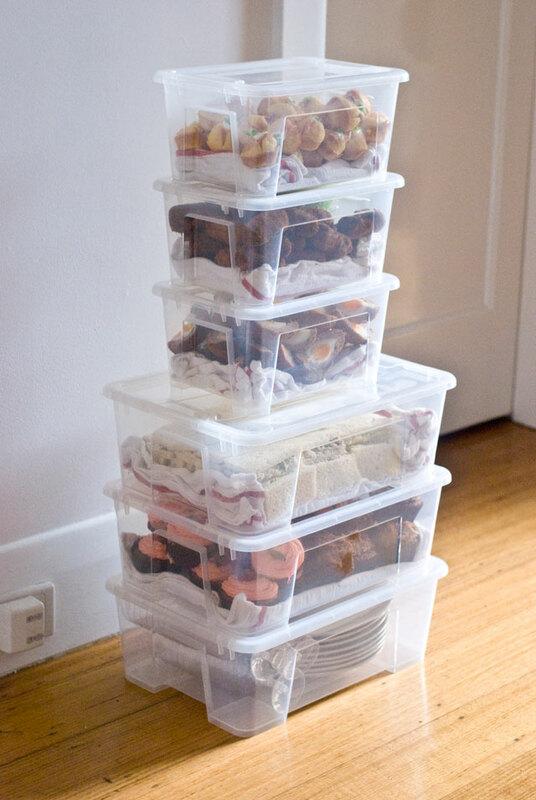 I’ve done a few catering jobs for the Spring Racing Carnival in the past (check out last year’s effort here), so when planning a menu there are a few things I always consider: how will the food travel? Is it easy to eat? What is the weather going to be, and will the food last these conditions? For example, last year, Stakes Day was really hot (I think about 35C-40C), so I didn’t want to do anything dairy based that might spoil in the hot weather. This year, the conditions were rather mild (mid 20s), so this wasn’t a huge issue. How the food transports is always an important factor though, as it needs to arrive in as beautiful condition as when it leaves me. I always make sure to pack my food in containers with lids so that when people put them in the back of the car to take with them, there is no chance they will get squashed. With this in mind, I tend to choose things that I can ‘pile up’ rather than ‘arrange’ on a plate, as toppings tend to fall off during transit. With these things in mind, I designed a menu I thought was interesting and varied. I liked the idea of making mini corn muffins, a savoury alternative to what is currently quite a fad here at the moment: cupcakes. They travel well and look impressive. The addition of the smoked salmon also make them a little more grown up. 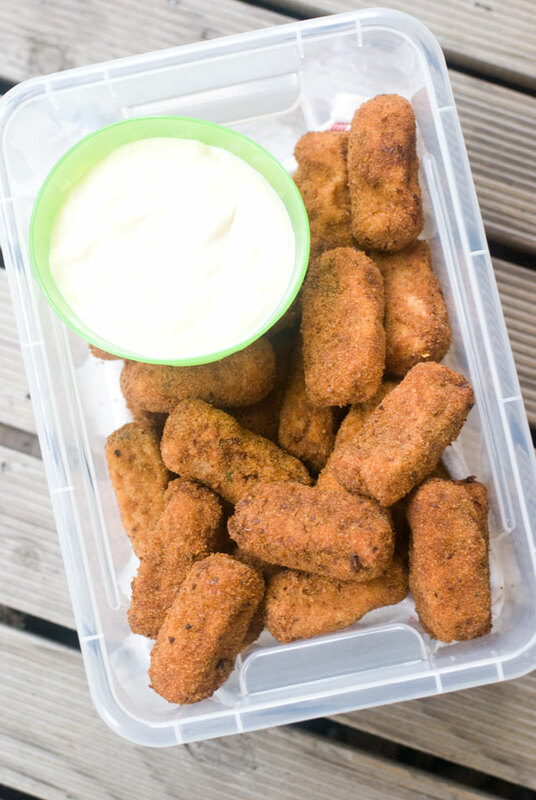 I also was keen to make some croquettes, as they are tasty and again, travel well. I went with the traditional Spanish tuna croquettes, and made a quick aioli to serve with them. After my successful quail scotch eggs from last year’s Christmas party, I decided I wanted to make them again. But when I was unable to get any quail eggs, I had to settle with the smallest regular eggs I could find. Of course, being the races, I had to make sandwiches. Chicken sandwiches are always a hit, so I made the same ones I made last year. It’s a family recipe, given to me by my grandmother. She used to make great curried egg sandwiches too, so I made some of these, as well as some prawn and fennel ones. The key is fresh bread, so first thing that morning I ran drove down to Baker’s Delight for 2 loaves of freshly baked goodness. Mrs L also requested some cupcakes, as she had a few kids coming along as well. I made a batch of my chocolate cupcakes which I topped with chocolate shards, as well as a batch of vanilla that I iced with pink icing, my favourite. With everything packed up and ready to go, Mrs L picked up her containers early Saturday morning. How cute do they looked all stacked up at my front door?? Preheat oven to 180C. Grease 48 mini muffin tins. In a bowl, combine milk, egg, butter, corn and salt. Using a hand held blender, blend the ingredients to a lumpy mix. Alternatively, place them in a processor and process till well combined but still a little lumpy. Sift in the flours and baking powder. Add the cornmeal and sugar and stir to combine. Spoon mix into 48 greased mini muffin tins and place in a moderate oven for 15-20 minutes until golden. Place muffins on a cooling rack and allow to cool. Cut salmon into 48 small pieces. 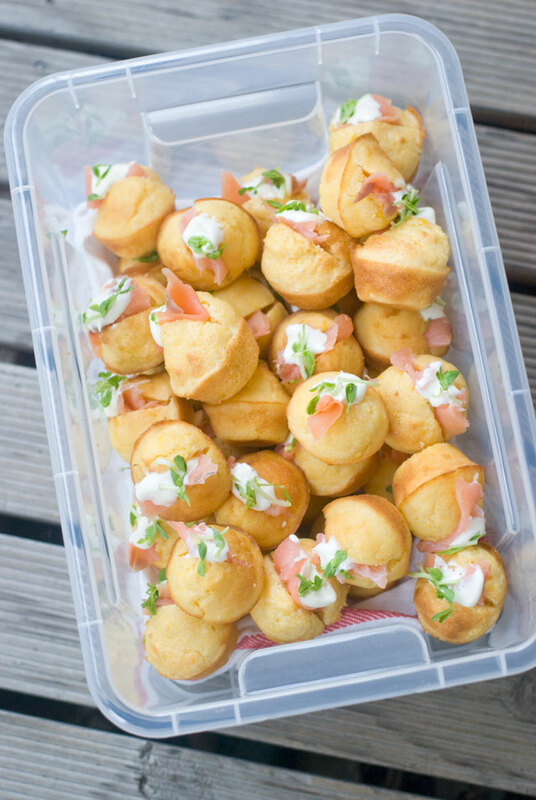 Cut a slit in the top of each muffin, and wedge a piece of salmon in each. Finish with a small amount of sour cream and a few snow pea sprouts. Bring a large pot of water with a steamer attachment to the boil. Peel potatoes and cut into 3-4cm cubes. Place potatoes in steamer and steam until tender, about 15 minutes. Test with the tip of a knife. Transfer to a bowl and mash potatoes with a fork or masher until smooth. Add butter and milk and season with salt and pepper to taste. Allow to cool. Place large frying pan over medium heat, add oil, and fry onions with a little salt until tender, about 5 minutes. Add garlic and paprika and fry until garlic is fragrant, about 1 minute. Remove from heat and allow to cool. Combine mashed potatoes, onion mixture, tuna and parsley. Season generously with salt and pepper. Transfer mix to the fridge for a few hours to firm up. This will make it easier to shape the croquettes. Using wet hands, roll the mix into small sausages, tapping each end on the bench to ke it flat. Transfer croquettes back to fridge for 30 minutes to firm up again. In batches, roll croquettes in flour, then egg, then breadcrumbs. Fill a deep saucepan with enough oil to reach 10cm up the side. Place over high heat and using a thermometer, bring it up to 180C. Alternatively if you don’t have a thermometer, test the temperature with a cube of bread – it should begin to brown after 30 seconds. Fry croquettes in batches until golden, drain on paper towel. Serve warm or cold with aioli. Combine mince, garlic salt and pepper. Separate into 6 balls the same size. Flatten each ball of mince in your hand, place egg on top, and fold mince over the egg to enclose. Pat the egg smooth. Repeat with remaining mince and eggs. Dust each egg with flour, roll in egg wash and then breadcrumbs. Fill a deep saucepan with enough oil to reach 20cm up the side. Place over high heat and using a thermometer, bring it up to 180C. Alternatively if you don’t have a thermometer, test the temperature with a cube of bread – it should begin to brown after 30 seconds. Fry scotch eggs in batches for 5 minutes until golden and cooked through. Drain on paper towel. Cut each egg into quarters and serve warm or cold. Finely dice the prawn meat and fennel. Place in a bowl and combine with dill, lemon juice and mayonnaise. Season well with salt and pepper. Butter bread and spread half the slices evenly with the prawn mixture. Sandwich together with remaining slices, trim off crusts and cut into fingers. Place the eggs in a saucepan of cold water and bring to the boil. Once boiling, cook for 8 minutes. Remove from heat and run eggs under cold water. Peel eggs. Using your hands, break up the eggs finely into a bowl. Add curry powder, mayonnaise, and season well with salt and pepper. Butter bread and spread half the slices evenly with the egg mixture. Sprinkle with a thin coating of sprouts. Spread the remaining slices with mayonnaise and sandwich together with the egg slices. Trim off crusts and cut into fingers. Preheat oven to 180C. Line a 12-pan muffin tin with liners. Using electric beaters, cream together butter and sugar until pale. Add milk, eggs and vanilla essence and stir with a spatula to combine. Sift in flour and gently stir until just combined. Fill muffin pans 2/3 of the way up with the mix and place in a moderate oven for 12-15 minutes or until cooked through. Remove cupcakes from tin and place on a rack to cool. Meanwhile for the icing, using electric beaters mix together ingredients, adding icing sugar a little at a time. When cupcakes are completely cooled, ice them using a star-tipped nozzle and top with a slice of strawberry.